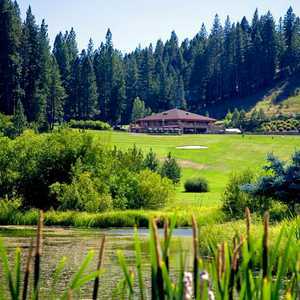 Can you slay the Dragon at Nakoma Golf Resort in Clio, California? GRAEAGLE, Calif. -- This part of California is one of the hottest resort destinations in the state right now, and much of the buzz focuses on the Nakoma Golf Resort and The Dragon Course designed by Robin Nelson. Golfers from all over California and Nevada want to take on the challenge of the Dragon course at Nakoma Golf Resort. The reputation of the golf course keeps growing because of its huge length -- more than 7,000 yards -- and a level of difficulty so tough that almost nobody has ever shot par from the tips. Beyond the unusual golf, the resort attracts visitors because of its unique buildings, unspoiled Sierra scenery and the fabulous cuisine served in the clubhouse restaurants. 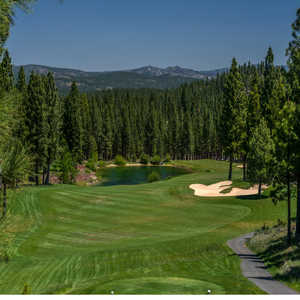 Golfers from all over California and Nevada want to take on the challenge, regardless of how hard it is to get to -- about an hour's drive from Reno, for example, or an hour from Lake Tahoe -- and regardless of how many balls the Dragon eats and how the Dragon scorches their handicaps. Nakoma Golf Resort is not a property owned and managed by a large corporation; it's the personal dream of a couple who were trying to do something special after they retired. The owners are Dariel and Peggy Garner, who had made a couple of fortunes previously -- first in selling software programs to banks and then by growing gourmet baby vegetables in Mexico at the height of the California cuisine boom. 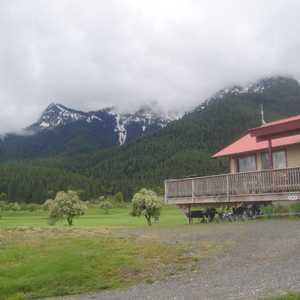 With their money in hand, they arrived in the area in 1995 looking for a site where they could build a retirement dream house. They found Graeagle in the Feather River country of California in a valley surrounded by mountains as gorgeous as those of Lake Tahoe or Yosemite National Park. There are a couple of small towns here -- Portola, Graeagle and Clio (the actual address for Nakoma) -- that love tourists, of course, but are free of the ticky-tacky commercialism of Lake Tahoe or the crowds that jam Yosemite. Even before the Dragon came along, the area was becoming a golf mecca with other new courses built locally in the last few years. All that makes for an interesting beginning to the Garner story. But the Garners have spun even more legends around themselves and Nakoma as time has gone on. "We traveled all over the West looking for a place to build a dream house -- Idaho, Oregon, you name it," Dariel says. "We put 60,000 miles on our Bronco looking for a place to live. In 1995 we arrived in this area and bought 1,280 acres, but we decided we couldn't put just one house on it. Wherever we had gone, we met all kinds of people looking for the same thing -- the perfect view property with water and sewers; so we knew we could sell to other people." So the Garners decided to build a subdivision, a resort and a golf course. Within a year of purchase, they had completed all the planning requirements and were dividing their property into about 400 lots. "The first 27 homesites sold in less than a month," Dariel says. "People really do love it here." Lot purchasers have really scored big. Jerry and Diane Ackerets who built an Adirondack-style lodge called "the Buffalo House" on the two acres purchased for $70,000, claim that buyers can now resell lots for three or four times the original price. "If you don't buy a lot when you first look at it," Diane says, "when you go home to think about it, it just feels good. You have to buy it." But this is more than just a wooded subdivision where everyone plants wildflowers instead of grass, the central clubhouse-lodge at Nakoma and the golf course that really complete the legend of the place. The clubhouse is an almost mythical creation of wood and stone with tall spires that was built based on plans that famed architect Frank Lloyd Wright drew up in 1924. The plans were done for a country club in Wisconsin that never built the project. Seventy years later, along came the Garners who hired the Taliesin Architects, Frank Lloyd Wright's firm, to design their resort. The Taliesin folks suggested using the old country club plans. "I remember standing in a spot where we were thinking about the building," says Peggy Garner, talking about the process she went through, "and seeing a pile of trash that someone had dumped there. I was upset about who would do such a thing, but I picked up an envelope that was lying there. It had an old Frank Lloyd Wright stamp on it, and I knew we were going to build the clubhouse there." So the 22,000-square-foot clubhouse that resembles a series of massive tepees now stands on a ridge on the Garners' property. It carries the name Nakoma -- a Chippewa word that means "I do as I promise," according to the Garners. It's also a variation of "Nakomis," grandmother of Hiawatha, the Chippewa in Longfellow's "Song of Hiawatha." The Garners carried out the native American theme by placing large golden figures of an Indian maiden and warrior in a pond below the clubhouse. The lodge-clubhouse is filled with furniture done in the style Wright once made famous. Special rock was quarried near Mexico City for the walls and for a 45-foot-tall stone fireplace and chimney. Inside the clubhouse are a wedding chapel; a well-stocked pro shop; the Wigwam and Loggia rooms, fabulous restaurants that draw diners from Reno and Lake Tahoe-Truckee as well as the Graeagle area; and a downstairs spa where you can get a massage after your round of golf, have a body scrub or therapeutic wrap or spiff up with a manicure. Then there are the legends spun around the Dragon, the 7,000-yard golf course that serves as the centerpiece of the Nakoma Golf Resort. According to the Garners, they were thinking about building the course even though neither one played golf at the time. "I wanted a course that would be beautiful from every perspective and that would give a persona to the community," Dariel says. The finished golf course, designed by Robin Nelson of Mill Valley, Calif., is a stunning set of 18 holes. Initially, the course was named "The Grizzly," but due to some objections from Jack Nicklaus' design firm, Peggy Garner came up with "The Dragon," a magical name that has proved to be a fantastic marketing ploy. Lost balls are "dragon food;" the club's slogan is "Send us your heroes;" holes have names like "Faith," "Hope," "Charity," "Looking Glass" and "Dragon's Pearl." The Garners chose Nelson, who also designed Mauna Lani on the Big Island of Hawaii, because he's well known for his ability to blend courses into the lay of the land. From the very first tee, you're amazed at the drama of the site. You stand on a lofty tee looking at a wide-open fairway far below. Miles away is the snow-capped Eureka Peak. The hole is called Dragon's Lookout. "It's our signature hole," says Peggy Garner. But then every other hole seems like a signature hole here. What gives the Dragon its bite? Why is this a course with a rating/slope of 74.2/147 from the back tees and 66.6/128 from the forward? The problem is that so much strategy and precise shotmaking is required that you can never really relax. There are huge carries off tees -- especially the back tees. You're funneling your ball through narrow fairways that are thickly lined with trees. Innumerable bunkers are ready to swallow the balls that finally make it to within a few yards of the green. And the course rolls and tumbles over the landscape making for some impossible lies. The length alone is not an issue if you choose the tee that suits your game. But you must be very, very accurate. There's no forgiveness for error and even good shots get punished sometimes. Still, there seem to be no end of golfers, however, eager to beat themselves up on the fairways. What's next for Nakoma Golf Resort? The Garners are now building a series of plush little villas, like miniature Nakoma clubhouses, where they are selling fractional ownerships, much like time-shares. Depending on how much time you buy, the purchase price ranges from $50,000 to $80,000 with an average of $2,500 in dues to be paid annually. Villa space can also be rented by visitors for from $575 to $775 a night. Although the price tags are steep, the Garners say that they are almost sold out in the several villas already built. They expect to build 27 of the one- and two-bedroom units. A nine-hole executive course is planned for the future. The Garners also have approvals from the county to build a small luxury-style hotel. Nakoma Golf Resort and the Dragon course really have changed the face of Graeagle. Pay a visit and find out what all the legends are about. Although we did have a lite lunch there, I was totally in awe of the whole place and litterly speechless at it's beauty and history.